Mediumship is the practice of certain people—known as mediums—to purportedly mediate communication between spirits of the dead and living human beings. There are different types of mediumship including spirit channeling, and ouija. Humans have been fascinated with contacting the dead since the beginning of human existence. Cave paintings by indigenous Australians date back 28,000 years, some depicting skulls, bones, spirits and the afterlife. Other cave paintings in Indonesia date back a further 10,000 years. Mediumship gained popularity during the 19th century, where ouija boards were used by the upper classes as a source of entertainment. Investigations during this period revealed widespread fraud—with some practitioners employing techniques used by stage magicians—and the practice began to lose credibility. Fraud is still rife in the medium/psychic industry, with cases of deception and trickery being discovered to this day. Several different variants of mediumship exist; arguably the best-known forms involve a spirit allegedly taking control of a medium's voice and using it to relay a message, or where the medium simply "hears" the message and passes it on. Other forms involve materializations of the spirit or the presence of a voice, and telekinetic activity. Mental mediums allegedly "tune in" to the spirit world by listening, sensing, or seeing spirits or symbols. Physical mediums are believed to produce materialization of spirits, apports of objects, and other effects such as knocking, rapping, bell-ringing, etc. by using "ectoplasm" created from the cells of their bodies and those of seance attendees. 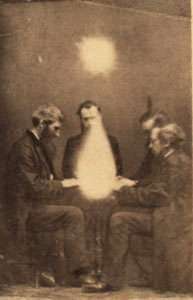 Channeling can be seen as the modern form of the old mediumship, where the "channel" (or channeller) allegedly receives messages from "teaching-spirit", an "Ascended Master", from God, or from an angelic entity, but essentially through the filter of his own waking consciousness (or "Higher Self"). Attempts to communicate with the dead and other living human beings, aka spirits, have been documented back to early human history. The story of the Witch of Endor (In the most recent edition of the NIV witch is rendered medium in the passage) tells of one who raised the spirit of the deceased prophet Samuel to allow the Hebrew king Saul to question his former mentor about an upcoming battle, as related in the First book of Samuel in the Jewish Tanakh (the Old Testament). "Trance mediumship" is often seen as a form of mental mediumship. In the later half of the 20th century, Western mediumship developed in two different ways. One type involved psychics or sensitives who speak to spirits and then relay what they hear to their clients. The other incarnation of non-physical mediumship is a form of channeling in which the channeler goes into a trance, or "leaves their body", allowing a spiritual entity to borrow their body, who then talks through them. When in a trance the medium appears to come under the control of the spirit of a departed soul, sometimes entering into a cataleptic state, although modern channelers may not. Some channelers open the eyes when channeling, and remain able to walk and behave normally. The rhythm and the intonation of the voice may also change completely. In spiritualism, psychic senses used by mental mediums are sometimes defined differently from in other paranormal fields. A medium is said to have psychic abilities but not all psychics function as mediums. The term clairvoyance, for instance, may be used by Spiritualists to include seeing spirits and visions instilled by spirits. The Parapsychological Association defines "clairvoyance" as information derived directly from an external physical source. Scientists who study anomalistic psychology consider mediumship to be the result of fraud and psychological factors. Research from psychology for over a hundred years has revealed that where there is not fraud, mediumship and Spiritualist practices can be explained by hypnotism, magical thinking and suggestion. Trance mediumship which is claimed by the Spiritualists to be caused by discarnate spirits speaking through the medium have been proven in cases to be alternate personalities from the medium's subconscious mind. Magicians such as Joseph Rinn have staged 'fake' séances in which the sitters have claimed to have observed genuine supernatural phenomena. Albert Moll studied the psychology of séance sitters. According to (Wolffram, 2012) "[Moll] argued that the hypnotic atmosphere of the darkened séance room and the suggestive effect of the experimenters’ social and scientific prestige could be used to explain why seemingly rational people vouchsafed occult phenomena." The psychologists Leonard Zusne and Warren Jones in their book Anomalistic Psychology: A Study of Magical Thinking (1989) wrote that spirits controls are the "products of the medium's own psychological dynamics." The medium may obtain information about their sitters by secretly eavesdropping on sitter's conversations or searching telephone directories, the internet and newspapers before the sittings. Mediums are known for employing a technique called cold reading and obtain information from the sitter's behavior, clothing, posture, and jewellery. Cold reading also explains why psychics have consistently failed scientific tests of their powers. By isolating them from their clients, psychics are unable to pick up information from the way those clients dress or behave. By presenting all of the volunteers involved in the test with all of the readings, they are prevented from attributing meaning to their own reading, and therefore can’t identify it from readings made for others. As a result, the type of highly successful hit rate that psychics enjoy on a daily basis comes crashing down and the truth emerges – their success depends on a fascinating application of psychology and not the existence of paranormal abilities. 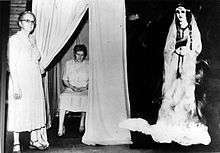 Helen Duncan in a séance with dolls. Magicians have a long history of exposing the fraudulent methods of mediumship. Early debunkers included Chung Ling Soo, Henry Evans and Julien Proskauer. Later magicians to reveal fraud were Joseph Dunninger, Harry Houdini and Joseph Rinn. The poet Robert Browning and his wife Elizabeth attended a séance on 23, July 1855 in Ealing with the Rymers. 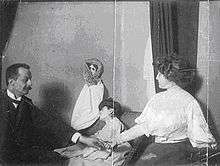 During the séance a spirit face materialized which Home claimed was the son of Browning who had died in infancy. Browning seized the "materialization" and discovered it to be the bare foot of Home. To make the deception worse, Browning had never lost a son in infancy. Browning's son Robert in a letter to The Times, December 5, 1902 referred to the incident "Home was detected in a vulgar fraud." The researchers Joseph McCabe and Trevor H. Hall exposed the "levitation" of Home as nothing more than him moving across a connecting ledge between two iron balconies. In a series of experiments in London at the house of William Crookes in February 1875, the medium Anna Eva Fay managed to fool Crookes into believing she had genuine psychic powers. Fay later confessed to her fraud and revealed the tricks she had used. Frank Herne a British medium who formed a partnership with the medium Charles Williams was repeatedly exposed in fraudulent materialization séances. In 1875 he was caught pretending to be a spirit during a séance in Liverpool and was found "clothed in about two yards of stiffened muslin, wound round his head and hanging down as far as his thigh." 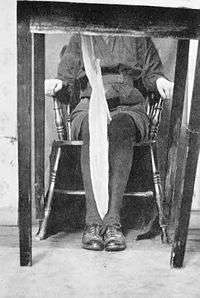 Florence Cook had been "trained in the arts of the séance" by Herne and was repeatedly exposed as a fraudulent medium. In 1880 the American stage mentalist Washington Irving Bishop published a book revealing how mediums would use secret codes as the trick for their clairvoyant readings. The Seybert Commission was a group of faculty at the University of Pennsylvania who in 1884-1887 exposed fraudulent mediums such as Pierre L. O. A. Keeler and Henry Slade. The Fox sisters confessed to fraud in 1888. Margaret Fox revealed that she and her sister had produced the "spirit" rappings by cracking their toe joints. The trance medium Leonora Piper was investigated by psychical researchers and psychologists in the late 19th and early 20th century. In an experiment to test if Piper's "spirit" controls were purely fictitious the psychologist G. Stanley Hall invented a niece called Bessie Beals and asked Piper's 'control' to get in touch with it. Bessie appeared, answered questions and accepted Dr. Hall as her uncle. The psychologist Joseph Jastrow wrote that Piper pretended to be controlled by spirits and fell into simple and logical traps from her comments. Science writer Martin Gardner concluded Piper was a cold reader that would "fish" for information from her séance sitters. The physiologist Ivor Lloyd Tuckett who examined Piper's mediumship in detail wrote it could be explained by "muscle-reading, fishing, guessing, hints obtained in the sitting, knowledge surreptitiously obtained, knowledge acquired in the interval between sittings and lastly, facts already within Mrs. Piper's knowledge." In 1907, Hereward Carrington exposed the tricks of fraudulent mediums such as those used in slate-writing, table-turning, trumpet mediumship, materializations, sealed-letter reading and spirit photography. Between 1908-1914 the Italian medium Francesco Carancini was investigated by psychical researchers and they discovered that he used phosphorus matches to produce "spirit lights" and with a freed hand would move objects in the séance room. In 1908 at a hotel in Naples, the psychical researcher Everard Feilding attended a series of séances with Eusapia Palladino. In a report Feilding claimed genuine supernatural activity had occurred in the séances, this report became known as the Feilding report. In 1910, Feilding returned to Naples, but this time accompanied with the magician William S. Marriott. Unlike the 1908 sittings, Feilding and Marriott detected her cheating, just as she had done in America. Her deceptions were obvious. Palladino evaded control and was caught moving objects with her foot, shaking the curtain with her hands, moving the cabinet table with her elbow and touching the séance sitters. Milbourne Christopher wrote regarding the exposure "when one knows how a feat can be done and what to look for, only the most skillful performer can maintain the illusion in the face of such informed scrutiny." 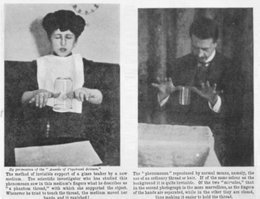 The Polish medium Stanisława Tomczyk's levitation of a glass beaker was exposed and replicated in 1910 by the magician William Marriott by means of a hidden thread. The Italian medium Lucia Sordi was exposed in 1911, she was bound to a chair by psychical researchers but would free herself during her séances. The tricks of another Italian medium Linda Gazzera were revealed in the same year, she would release her hands and feet from control in her séances and use them. Gazzera would not permit anyone to search her before a séance sitting, as she concealed muslin and other objects in her hair. On 4 February 1922, Harry Price with James Seymour, Eric Dingwall and William Marriott had proven the spirit photographer William Hope was a fraud during tests at the British College of Psychic Science. Price wrote in his SPR report "William Hope has been found guilty of deliberately substituting his own plates for those of a sitter... It implies that the medium brings to the sitting a duplicate slide and faked plates for fraudulent purposes." The medium Kathleen Goligher was investigated by the physicist Edmund Fournier d'Albe. 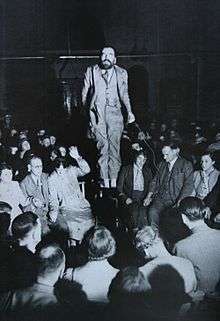 On July 22, 1921 in a séance he observed Goligher holding the table up with her foot. He also discovered that her ectoplasm was made of muslin. During a séance d'Albe observed white muslin between Goligher's feet. The psychical researchers Eric Dingwall and Harry Price re-published an anonymous work written by a former medium entitled Revelations of a Spirit Medium (1922) which exposed the tricks of mediumship and the fraudulent methods of producing "spirit hands". Originally all the copies of the book were bought up by spiritualists and deliberately destroyed. 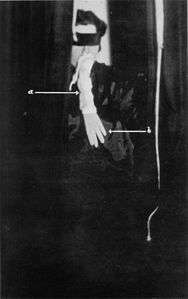 In 1923, the magician Carlos María de Heredia revealed how fake spirit hands could be made by using a rubber glove, paraffin and a jar of cold water. In 1922, Harry Price, James Seymour, Eric Dingwall and William Marriott exposed the fraud of the spirit photographer William Hope. Price wrote in his report "William Hope has been found guilty of deliberately substituting his own plates for those of a sitter... It implies that the medium brings to the sitting a duplicate slide and faked plates for fraudulent purposes." The Austrian medium Rudi Schneider was investigated in 1924 by the physicists Stefan Meyer and Karl Przibram. They caught Rudi freeing his arm in a series of séances. 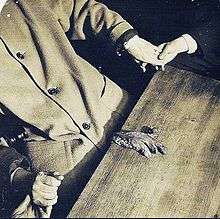 Rudi claimed he could levitate objects but according to Harry Price a photograph taken on April 28, 1932 showed that Rudi had managed to free his arm to move a handkerchief from the table. According to Warren Jay Vinton, Schneider was an expert at freeing himself from control in the séance room. Oliver Gatty and Theodore Besterman who examined the mediumship of Schneider concluded there is "no good evidence that Rudi Schneider possesses supernormal powers." In 1930 the Polish medium Stanisława P. was tested at the Institut Metapsychique in Paris. French psychical researcher Eugéne Osty suspected in the séance that Stanislawa had freed her hand from control. Secret flashlight photographs that were taken revealed that her hand was free and she had moved objects on the séance table. It was claimed by spiritualists that during a series of séances in 1930 the medium Eileen J. Garrett channeled secret information from the spirit of the Lieutenant Herbert Carmichael Irwin who had died in the R101 crash a few days before the séance. Researcher Melvin Harris who studied the case wrote that the information described in Garrett's séances were "either commonplace, easily absorbed bits and pieces, or plain gobblede- gook. The so-called secret information just doesn't exist." The medium Frank Decker was exposed as a fraud in 1932. A magician and séance sitter who called himself M. Taylor presented a mail bag and Decker agreed to lock himself inside it. During the séance objects were moved around the room and it was claimed spirits had released Decker from the bag. 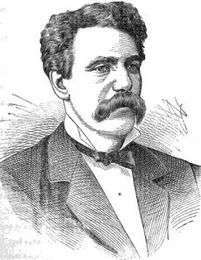 It was later discovered to have been a trick as Martin Sunshine, a magic dealer admitted that he sold Decker a trick mail bag, such as stage escapologists use, and had acted as the medium’s confederate by pretending to be M. Taylor, a magician. The British medium Estelle Roberts claimed to materialize an Indian spirit guide called "Red Cloud". Researcher Melvin Harris who examined some photographs of Red Cloud wrote the face was the same as Roberts and she had dressed up in a feathered war-bonnet. 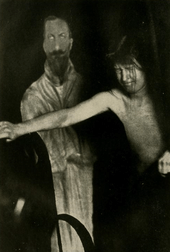 A series of mediumistic séances known as the Scole Experiment took place between 1993–98 in the presence of the researchers David Fontana, Arthur Ellison and Montague Keen. This has produced photographs, audio recordings and physical objects which appeared in the dark séance room (known as apports). A criticism of the experiment was that it was flawed because it did not rule out the possibility of fraud. The skeptical investigator Brian Dunning wrote the Scole experiments fail in many ways. The séances were held in the basement of two of the mediums, only total darkness was allowed with no night vision apparatus as it might "frighten the spirits away". The box containing the film was not examined and could easily have been accessible to fraud. And finally, even though many years have passed, there has been no follow-up, no further research by any credible agency or published accounts. 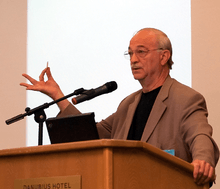 Joe Nickell a notable skeptic of mediumship. According to Nickell modern mediums use mentalist techniques such as cold reading. Modern spiritualists and psychics keep detailed files on their victims. As might be expected, these files can be very valuable and are often passed on from one medium or psychic to another when one retires or dies. Even if a psychic doesn’t use a private detective or have immediate access to driver’s license records and such, there is still a very powerful technique that will allow the psychic to convince people that the psychic knows all about them, their problems, and their deep personal secrets, fears, and desires. The technique is called cold reading and is probably as old as charlatanism itself... If John Edward (or any of the other self-proclaimed speakers with the dead) really could communicate with the dead, it would be a trivial matter to prove it. All that would be necessary would be for him to contact any of the thousands of missing persons who are presumed dead—famous (e.g., Jimmy Hoffa, Judge Crater) or otherwise—and correctly report where the body is. Of course, this is never done. All we get, instead, are platitudes to the effect that Aunt Millie, who liked green plates, is happy on the other side. An experiment conducted by the British Psychological Society in 2005 suggests that under the controlled condition of the experiment, people who claimed to be professional mediums do not demonstrate the mediumistic ability. In the experiment, mediums were assigned to work the participants chosen to be “sitters.” The mediums claimed to contact the deceased who were related to the sitters. The research gather the numbers of the statements made and have the sitters rate the accuracy of the statements. The readings that were considered to be somewhat accurate by the sitters were very generalized, and the ones that were considered inaccurate were the ones that were very specific. The exposures of fraudulent activity led to a rapid decline in ectoplasm and materialization séances. Investigator Joe Nickell has written that modern self-proclaimed mediums like John Edward, Sylvia Browne, Rosemary Altea and James Van Praagh are avoiding the Victorian tradition of dark rooms, spirit handwriting and flying tambourines as these methods risk exposure. They instead use “mental mediumship” tactics like cold reading or gleaning information from sitters before hand (hot reading). Group readings also improve hits by making general statements with conviction, which will fit at least one person in the audience. Shows are carefully edited before airing to show only what appears to be hits and removing anything that does not reflect well on the medium. The article about this phenomenon in Encyclopedia Britannica places emphasis that "… one by one spiritual mediums were convicted of fraud, sometimes using the tricks borrowed from scenic "magicians" to convince their paranormal abilities". In the article it is also noted that "… the opening of the wide ranging fraud happening on spiritualistic sessions caused serious damage to reputation of the movement of a Spiritualism and in the USA pushed it on the public periphery". ↑ O'Keeffe, Ciaran (May 2005). "Testing Alleged Mediumship: Methods and Results". British Journal of Psychology. doi:10.1348/000712605X36361. ISSN 0007-1269. ↑ "Medium - Definition". Dictionary.com. Retrieved 23 March 2007. ↑ Brandon, Ruth. (1983). Scientists and the Supernormal. New Scientist. 16 June. pp. 783-786. ↑ Anna Hurwic, Pierre Curie, translated by Lilananda Dasa and Joseph Cudnik, Paris, Flammarion, 1995, pp. 65, 66, 68, 247-48. ↑ "W.T. Stead and Spiritualism - The W.T. Stead Resource Site". attackingthedevil.co.uk. ↑ Jones, Kelvin I. (1989). Conan Doyle and the Spirits: The Spiritualist Career of Arthur Conan Doyle. Aquarian Press. ↑ Sutcliffe, Steven J. (2002). Children of the New Age. p. 35. 1 2 The Autobiography of a Fortune Teller by C. Doreen Phillips, Vantage Press, 1958. ↑ Richard Castillo (1995) Culture, Trance, and the Mind-Brain. Anthropology of Consciousness. Volume 6, Issue 1, pages 17–34, March 1995. ↑ Braude, Anne, Radical Spirits, Spiritualism and Women's Rights in Nineteenth Century America. Bloomington: Indiana University Press, 2001. ↑ Deborah Blum. (2006). Ghost Hunters, William James] and the Search for Scientific Proof of Life After Death. The Penguin Press. ↑ God's World: A Treatise on Spiritualism Founded on Transcripts of Shorthand Notes Taken Down, Over a Period of Five Years, in the Seance-Room of the William T. Stead Memorial Center (a Religious Body Incorporated Under the Statutes of the State of Illinois), Mrs. Cecil M. Cook, Medium and Pastor. Compiled and Written by Lloyd Kenyon Jones. Chicago, Ill.: The William T. Stead Memorial Center, 1919. ↑ Somerlott, Robert, Here, Mr. Splitfoot. Viking, 1971. ↑ Connor, Steven (1999). "9. The Machine in the Ghost: Spiritualism, Technology and the 'Direct Voice'". In Buse, Peter; Stott, Andrew. Ghosts: deconstruction, psychoanalysis, history. Palgrave Macmillan. pp. 203–225. ISBN 978-0-312-21739-6. ↑ "What is a psychic?". UK Psychic Readings. Retrieved 30 July 2013. ↑ Wood, Matthew (2007). Possession Power and the New Age: Ambiguities of Authority in Neoliberal Societies. Ashgate Publishing, Limited. ISBN 0-7546-3339-X. ↑ Brown, Michael F. (1999). The Channeling Zone: American Spirituality in an Anxious Age. Harvard University Press. ISBN 0-674-10883-3. ↑ Klimo, Jon (1998). Channeling: Investigations on Receiving Information from Paranormal Sources. North Atlantic Books. p. 100. ISBN 978-1-55643-248-4. ↑ Chalmers, Robert (8 July 2007). "Interview: The couple who claim they can make you rich beyond your wildest dreams". The Independent. ↑ Koven, Jean-Claude (2004). Going Deeper: How to Make Sense of Your Life When Your Life Makes No Sense. Prism House Press. p. 389. ISBN 0-972-39545-8. ↑ Wilcock, David (2014). The Synchronicity Key: The Hidden Intelligence Guiding the Universe and You. Plume. ISBN 0-142-18108-0. ↑ Wolffram, Heather. (2012). ‘Trick’, ‘Manipulation’ and ‘Farce’: Albert Moll’s Critique of Occultism. Medical History 56(2): 277-295. ↑ Leonard Zusne, Warren H. Jones. (1989). Anomalistic Psychology: A Study of Magical Thinking. Psychology Press. p. 221. ISBN 978-0805805086 "The spirits, controls, and guides of a medium are the products of the medium's own psychological dynamics. On the one hand, they personify the medium's hidden impulses and wish life. On the other, they are also shaped by the expectations of the medium's sitters, the medium's experience, the cultural background, and the spirit of the times." ↑ Wiseman, R., Greening, E., and Smith, M. (2003). Belief in the paranormal and suggestion in the seance room. British Journal of Psychology, 94 (3): 285-297. ↑ Alan Gauld. (1968). The Founders of Psychical Research. Routledge & K. Paul. ↑ Chung Ling Soo. (1898). Spirit Slate Writing and Kindred Phenomena. Munn & Company. Henry Evans. (1897). Hours With the Ghosts Or Nineteenth Century Witchcraft. Kessinger Publishing. Julien Proskauer. (1932). Spook crooks! Exposing the secrets of the prophet-eers who conduct our wickedest industry. New York, A. L. Burt. ↑ Joseph Dunninger. (1935). Inside the Medium's Cabinet. New York, D. Kemp and Company. Harry Houdini. (1924). A Magician Among the Spirits. Cambridge University Press. Joseph Rinn. (1950). Sixty Years Of Psychical Research: Houdini And I Among The Spiritualists. Truth Seeker. ↑ Preliminary Report of the Commission Appointed by the University of Pennsylvania, The Seybert Commission, 1887. 1 April 2004. ↑ Joseph McCabe. (1920). Spiritualism: A Popular History from 1847. Dodd, Mead and Company. pp. 110-112. A Mr. Merrifield was present at one of the sittings. Home's usual phenomena were messages, the moving of objects (presumably at a distance), and the playing of an accordion which he held with one hand under the shadow of the table. But from an early date in America he had been accustomed occasionally to "materialise" hands (as it was afterwards called). The sitters would, in the darkness, faintly see a ghostly hand and arm, or they might feel the touch of an icy limb. Mr. Merrifield and the other sitters saw a "spirit-hand" stretch across the faintly lit space of the window. But Mr. Merrifield says that Home sat, or crouched, low in a low chair, and that the "spirit-hand" was a false limb on the end of Home's arm. At other times, he says, he saw that Home was using his foot." ↑ John Casey. (2009). After Lives: A Guide to Heaven, Hell and Purgatory. Oxford. p. 373. ISBN 978-0199975037 "The poet attended one of Home's seances where a face was materialized, which, Home's spirit guide announced, was that of Browning's dead son. Browning seized the supposed materialized head, and it turned out to be the bare foot of Home. The deception was not helped by the fact that Browning never had lost a son in infancy." ↑ Joseph McCabe. (1920). Is Spiritualism based on Fraud? : The Evidence Given by Sir A.C. Doyle and Others Drastically Examined. London: Watts & Co. pp. 48-50. Also see the review of The Enigma of Daniel Home: Medium or Fraud? by Trevor H. Hall in F. B. Smith. (1986). Victorian Studies. Volume. 29, No. 4. pp. 613-614. ↑ Massimo Polidoro. (2000). Anna Eva Fay: The Mentalist Who Baffled Sir William Crookes. Skeptical Inquirer 24: 36-38. ↑ Paul Kurtz. (1985). A Skeptic's Handbook of Parapsychology. Prometheus Books. p. 29. ISBN 978-0879753009 "Florence Cook was caught cheating not only before her séances with Crookes but also afterward. Furthermore, she learned her trade from the mediums Frank Herne and Charles Williams, who were notorious for their cheating." Also see M. Lamar Keene. (1997). The Psychic Mafia. Prometheus Books. p. 64. ISBN 978-1573921619 "The most famous of materialization mediums, Florence Cook-- though she managed to convince a scientist, Sir William Crookes, that she was genuine-- was repeatedly exposed in fraud. Florence had been trained in the arts of the séance by Frank Herne, a well-known physical medium whose materializations were grabbed on more than one occasion and found to be the medium himself." ↑ Washington Irving Bishop. (1880). Second Sight Explained: A Complete Exposition of Clairvoyance or Second Sight. Edinburgh: John Menzies. ↑ Preliminary report of the Commission appointed by the University of Pennsylvania to investigate modern spiritualism, in accordance with the request of the late Henry Seybert (1887). ↑ Samri Baldwin. (1895). The Secrets of Mahatma Land Explained Brooklyn, N.Y., Press of T. J. Dyson & Son. ↑ Joseph Jastrow. (1911). Studies in Spiritism by Amy E. Tanner. The American Journal of Psychology. Vol. 22, No. 1. pp. 122-124. ↑ Martin Gardner. Are Universes Thicker Than Blackberries? "How Mrs. Piper Bamboozled William James". W. W. Norton & Company. pp. 252–62. ↑ Hereward Carrington. (1907). The Physical Phenomena of Spiritualism. Herbert B. Turner & Co.
↑ Eric Dingwall. (1927). How to Go to a Medium. K. Paul, Trench, Trübner. pp. 31-32. ↑ Charles Arthur Mercier. (1917). Spiritualism and Sir Oliver Lodge. London: Mental Culture Enterprise. ↑ Harry Price, Fifty Years of Psychical Research, chapter XI: The Mechanics of Spiritualism, F&W Media International, Ltd, 2012. ↑ Universitetskomiteen, Mediet Einer Nielsen, kontrolundersøkelser av universitetskomiteen i Kristiania. (Kristiania 1922). ”Rapport fra den av Norsk Selskab for Psykisk Forskning nedsatte Kontrolkomité”, Norsk Tidsskrift for Psykisk Forskning 1 (1921-22). ↑ Eric Dingwall, Harry Price. (1922). Revelations of a Spirit Medium. Kegan Paul, Trench, Trübner & Co.
↑ "Fraudulent Mediums". Lyceum Library. ↑ Warren Jay Vinton. The Famous Schneider Mediumship: A Critical Study of Alleged Supernormal Events. No. 4 April 1927 in C. K. Ogden Psyche: An Annual General and Linguistic Psychology. 1920-1952 Routledge/Thoemmes Press, 1995. ↑ Further Tests of the Medium Rudi Schneider. (1934). Nature 134, 965-966. ↑ Brian Righi. (2008). Ghosts, Apparitions and Poltergeists: An Exploration of the Supernatural through History. Llewellyn Publications. Llewellyn Publications. p. 52. ISBN 978-0738713632 "One medium of the 1920s, Mina Crandon, became famous for producing ectoplasm during her sittings. At the height of the séance, she was even able to produce a tiny ectoplasmic hand from her navel, which waved about in the darkness. Her career ended when Harvard biologists were able to examine the tiny hand and found it to be nothing more than a carved piece of animal liver." ↑ Nandor Fodor. (1960). The Haunted Mind: A Psychoanalyst Looks at the Supernatural. Helix Press. ↑ Ronald Edwin. (1955). Clock Without Hands. Sidgwick. ↑ Allen Spraggett, The Unexplained, (New York: New American Library, 1967). ↑ M. Lamar Keene. (1997). The Psychic Mafia. Prometheus Books. p 122. ISBN 978-1573921619 "A medium still riding high in England is Leslie Flint, famed as an exponent of direct voice. William Rauscher and Allen Spraggett, who attended a sitting Flint held in 1970 in New York, said that it was the most abysmal flop of any seance they had endured. All the spirit voices sounded exactly like the medium and displayed an incredible ignorance of nearly everything pertaining to the sitters. The "mediumship " was second-rate ventriloquism." ↑ Grossman, Wendy. (1991). Dismissal is not disproof. New Scientist. Vol. 130. Issue 1768, p. 53. 1 2 "The Scole Experiment: Said to be the best evidence yet for the afterlife -- but how good is that evidence?". Skeptoid. 2009-11-10. Retrieved 2011-10-30. ↑ Hyman, Ray (Jan–Feb 2003). "How Not to Test Mediums: Critiquing the Afterlife Experiments". Skeptical Inquirer Magazine. Retrieved 2012-05-21. ↑ "Jury Convicts Defendant in $25 Million Fraud Scheme" (Press release). Southern District of Florida, US Attorney's Office, US Department of Justice. 2013-09-26. Retrieved 2013-10-10. ↑ Musgrave, Jane (2013-09-27). "Psychic convicted on all fraud counts". The Palm Beach Post. 105 (171) (First ed.). p. 1. ↑ Vasquez, Michael (2011-08-16). "Psychic scam a $40 million Fort Lauderdale - family affair, feds allege - A Fort Lauderdale family spent the last 20 years raking in millions as fake psychics, prosecutors allege in a newly unsealed indictment". The Miami Herald. – via NewsBank (subscription required) . ↑ "Investigative Files: John Edward: Hustling the Bereaved". CSI. Nov–Dec 2001. Retrieved 2011-05-12. ↑ Shermer, Michael. "Deconstructing the Dead, "Crossing over" to expose the tricks of popular spirit mediums". August 2001. Scientific American. Retrieved 24 December 2011. ↑ "James Randi's Swift - April 21, 2006". Randi.org. Retrieved 2012-01-03. ↑ Woliver, Robbie (July 16, 2000). "An Encounter With a Television Psychic". The New York Times. Retrieved 24 December 2011. ↑ Robert T. Carroll. Subjective validation. // The Skeptic's Dictionary. Joseph McCabe. (1920). Scientific Men and Spiritualism: A Skeptic's Analysis. The Living Age. June 12. pp. 652–657. A skeptical look at SPR members who had supported Spiritualism, concludes they were duped by fraudulent mediums.